Le'Veon Bell is starting week 1, but he faces a marijuana-related DUI charge stemming from a preseason arrest. Today the Pittsburgh Steelers hope to ride running back Le’Veon Bell to victory over the Cleveland Browns despite the fact that Bell and fellow RB LeGarrette Blount were riding dirty a few hours before a flight to Philly for a preseason game last month. 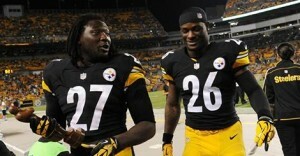 Bell and Blount were nabbed for marijuana possession (about 20 grams worth) and Bell, who was driving, picked up a DUI. Funny thing is, he had no idea DUIs applied to drugs. Frankly, who could blame him? He was smoking marijuana hours before a team flight and he is still starting Sunday. So much for accountability in Pittsburgh. Ignoring the comical lack of punishment, Bell’s mistaken belief that DUIs only apply to driving while drunk provides a good opportunity to review DUI law in the Keystone State. In Pennsylvania, a person is guilty of DUI if he or she drives (1) with any amount of a Schedule I controlled substance under the Controlled Substance Act in his or her blood, (2) with a metabolite of a schedule I substance in his or her blood, (3) under the influence of a drug or combination of drugs to a degree which impairs his or her ability to safely drive, or (4) under the combined influence of alcohol and a drug or combination of drugs to a degree which impairs the individual’s ability to safely drive. 75 Pa. C.S.A. §§ 3802(d)(1)-(3). Steelers running backs Le'Veon Bell (right) and LeGarrette Blount are apparently pot pals. Since this is Bell’s first offense, as far as I know, he faces misdemeanor charges which can result in punishment of imprisonment for a minimum of 72 consecutive hours, maximum imprisonment of 6 months; fine of not less than $1000 and not more than $5000; required attendance at an alcohol highway safety school; license suspension of at least 18 months; and up to 150 hours of community service. Id. 3803(a)(1); Id. § 3804(c)(1)(i); Id. §§ 3804(c)(1)(ii)-(iii); Id. §§ 3804(e)-(f). Notably, even if not presently impaired, someone with cannabis in their system can still face a DUI charge. Even though cannabis can linger in someone’s system for more than a week, Pennsylvania law shows no mercy. Additionally, have a medical prescription for marijuana from another state does not save you in PA.
For instance, the Pennsylvania Supreme Court rules in Com. v. Etchison, 916 A.2d 1169 (Pa. 2007) that there is no equal protection violation in disallowing persons to operate with Schedule I drug or metabolite present in system; conviction does not rest on whether driver is impaired, but instead statute prohibits operation of a motor vehicle by any driver with Schedule I substances present. Pennsylvania court found all drivers are treated the same under statute. Although Bell is still the starting running back for the Steelers with no football-related punishment in sight, he will not soon forget the harsh lesson he just learned on DUI law. Do not drive while high. Period. Or if you make millions of dollars per year, hire a driver.